Arthritis is derived from the Greek words "Arthros" meaning joint & "itis" meaning inflammation. 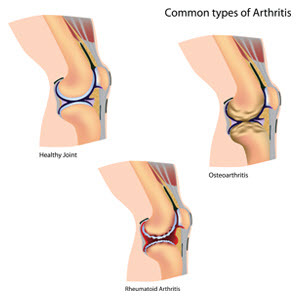 Any inflammation/ irritation/wear & tear of the joint is called arthritis. In the initial stages arthritis results in pain & stiffness of the joint. Later on the muscles around the joint weaken & become smaller in size. Towards the end, the joint loses most of its useful movement & the bone develops deformities. Broadly speaking arthritis is of two main types; inflammatory arthritis & non inflammatory arthritis. The more common non-inflammatory arthritis is also known as osteoarthritis is due to the age related wear & tear of the joint cartilage. The less common inflammatory arthritis is due to the body producing antibodies to the joint cartilage. The body reacts against its own tissue & causes widespread damage to the joints. lt depends on the joint affected. If knee is affected, it causes pain in the knee, with decreased ability to walk & run. Stiffness of the knees makes simple things like getting into a chair or getting out of it difficult. Stair climbing also becomes increasingly difficult. In the spine, pain is brought on by bending. Sometimes the tiny nerve endings that branch off from the spinal cord & travel in various directions can get pinched by excess bone formation that is seen with arthritis. This results in numbness & tingling in the arms & legs depending on the area affected (neck vs low back). Hip arthritis makes sitting difficult &there is pain especially in the night. Finger arthritis makes down fine things difficult like turning a key, holding a pen or a spoon to eat. It is the most common form of arthritis affecting our joints. Really speaking it is not a disease at all ! It is simply a manifestation of ageing. As me grow older our joints undergo wear & tear. Normally each of our joints has a cushion of variable thickness at its ends called, the cartilage. As we age, the thickness of the cartilage decreases, forcing raw bone to come in contact with raw bone, thereby leading to pain. Our joints have another protective mechanism called the "synovial fluid”. In our youth, healthy thick viscous synovial fluid is produced which adds to this Iubrication. As we age, our joints produce copious amounts of less viscous watery synocial fluid that is Iess efficient in lubricating the joint.The reason why we develop arthritis is not fully known. Almost any joint can be effected, the commonest being the knees, hips, neck, lower back & the fingers. Usually through a good clinical history & detailed examination, one can diagnose osteoarthritis. Sometimes blood tests may be required to distinguish if from the more serious inflammatory arthritis. X rays will be required in all instances to assess the stage of the disease.Very rarely MRl may also be required in addition to study the soft tissues around the joint. Once the smooth cartilage of the joint is destroyed, it cannot be replaced by any known modern treatment. However, if one keeps the muscles around a joint strong through exercise, the ill effects of the lost cartilage can be minimised. Anti-nfIammatory medicines (loosely called pain killers) are also prescribed judiciously for a short period to help relieve the pain & inflammation of the sore joints. Prolonged intake of these medicines is harmful for the heart, stomach & kidneys. In case you feel the need to take these medicines on a daily basis, you may be suffering from an advanced stage of the disease & might benefit from a joint replacement, Collagen powders are increasingly being used for the treatment of osteoarthritis of the knee. They are contained in a sachet & are meant to be dissolved in a cup of lukewarm water & gulped down on a daily basis for 3-6 months. They have a role to play in early arthritis, once the disease is advanced, they have little to no therapeutic effect. Newer therapies like willow bark extract are about to enter the market & will usher in an exciting phase of naturally occurring plant based pain relief medications. These medicines relieve pain & unlike the mainstream painkillers, they are virtually devoid of all major side effects.